Elegant classic design. Beautiful white porcelain bath accessories with an exquisite silver accent. You can feel the quality of this accessory set. Designed and produced by well-known German brand Kleine Wolke, established in 1968, and is backed by their quality guarantee..
Tumbler: Thick porcelain construction with a glossy finish. The silver accent is perfectly done. 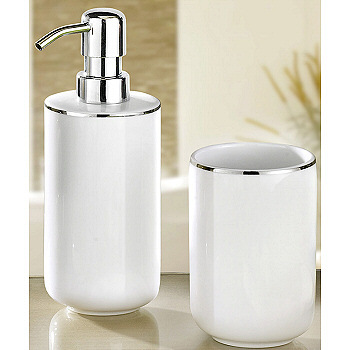 Soap Dispenser: Glossy white porcelain dispenser with shiny chrome finish for the pump. The pump is high quality and durable. This dispenser can hold 13.5oz of liquid soap or lotion. Toilet Brush Set: Really beautiful. Porcelain toilet brush holder. Toilet brush handle has a chrome finish.